Community Supported Agriculture (CSA) is a new idea in farming that reconnects families back to a local farmer that grows their food. Members receive shares in the farm’s bounty throughout the growing season, as well as satisfaction gained from reconnecting to the land and enjoying a direct link to a fresh, healthy, local food source. 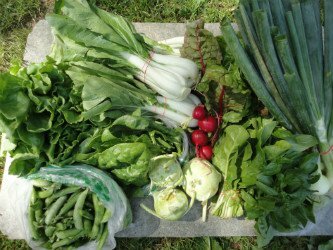 McDougal’s Farm is now accepting membership applications for the upcomig growing season. 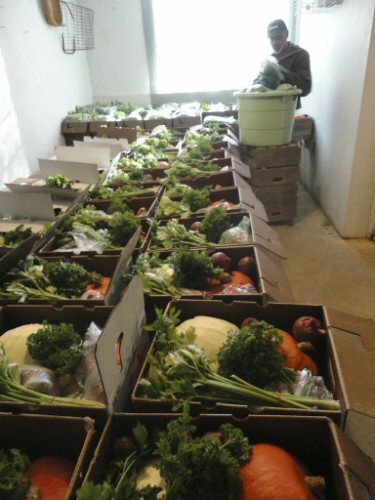 It’s easy: you pay for a season’s worth of vegetables before the growing season begins and we deliver them to the designated drop off site of your choice for 18 weeks, beginning early June to mid October. Early sign up is recommended and helps us with our planning. • Approximately 18 weeks of chemical free vegetables grown in an Earth friendly manner that are considerably more healthy and delicious than conventional produce, delivered as early as the second week in June through mid October depending on frost. • Invitations and updates on family farm events, children’s and adult workshops. • Peace of mind in knowing that you are feeding your family nutritious, safely handled food reserved weekly just for you….no need to beat the market. • A farm with which you and your family are welcome to be involved in the planting and harvesting as much or as little as you wish. • The opportunity to share with your children home cooking & the growing process which we hope will be a part of their future. 2 heads of Romaine lettuce, 4 tomatoes (heirlooms and slicers), 1 pt. cherry tomatoes, 3 onions, 2 bell peppers, 1 lb. green or yellow beans, 2-3 small zucchinis or summer squash, 3 cucumbers, 1 head of broccoli, and 1 bunch of basil. 1 lb. lettuce mix, 1 head of cauliflower, 1 head of broccoli, 2 heads of garlic, 1 bunch of carrots, 3 lb. of potatoes, 1 butternut or acorn squash, 1 bunch of celery, 3 red onions, and 1 bunch of kale. You will be informed of set weekly Thursday pick up time at the following drop sites by May 31st. You may choose from one of the following: the Farm (Deerbrook), Natural Living (Antigo), Center of Health and Performance (Antigo, Hospital site), Sweet Thyme (Antigo’s Northside) Bass Lake (Summit Lake area), Advanced Health (Rhinelander) and Red Clover Market, Weston (Wausau area), Patina’s Coffee House (Wausau downtown) and Gress’s Wellness Center (Merrill). New site suggestions or offers welcomed. 1. Pick up your box at an agreed upon location on the same day as delivery. This is important for freshness and as a courtesy to your host. Send a friend if you can’t make it. 2. Return your empty box when you pick up or receive the new one. We repack and use them again the following week. 3. Stay connected, read your families weekly emailed newsletter and provide us with feedback. This is one of the perks of a CSA….you get to know your farmer! *All credit card payments must be paid in the full and will include a minimal convenience fee. We still accept multi- payments when paying with check. Every Other Week Box - ($25.22/week) *New Two payments of $115. or one payment of $227. This is an every other week, 1/2 bushel box (9 out of the 18 week season). For singles, smaller appetites or families on the go that still want to eat healthy. Standard Share - ($21.44/week) Most popular Two payments of $194.50. or one payment of $386. This standard share is a weekly approximate ½ bushel box of fresh veggies for 18 weeks. This share is best for 1-2 people or a larger family that may not use as many vegetables. Large Share - ($29.94/week) Best Value! Two payments of $271. or one payment of $539. The large share is a weekly approximate ¾ bushel box of fresh veggies. Has the same varieties as the standard but includes about 30% more veggies. A good 4-5 person or large family size. Worker Share ...(please call)…….We offer a limited number of worker shares. Workers/members commit to approximately 4 1/2 hours/wk. of labor for 18 weeks through the growing season to pay for their large share. Winter Share - (price/ sizes to be announced) We offer a limited number of winter shares offered to our regular season members. This is a one time delivery before Thanksgiving. It includes end of the season storage crops such as squash, potatoes, carrots, beets and cabbage. Sign up for this popular share will be available late in the summer. Helping Hand Fund - (Donation) Contributing to the 'Helping Hand Fund' allows you to partially pay or donate towards another family's (with limited income) membership into our CSA with a donation size of your choice. If you contribute to a "Helping Hand Fund" you will be considered a farm member and welcome at all farm events.